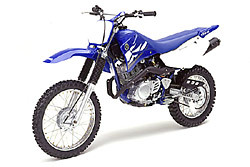 The smallest member of our four-stroke family of off-road motorcycles. The TT-R90. Air-cooled, 89cc, 4-stroke engine puts out smooth, reliable power perfectly suited to the smaller novice rider. CD ignition system delivers hot, reliable spark and requires minimal maintenance. A low, 24.6" seat height provides handling-enhancing low center-of-gravity and allows most riders to put both feet down for added confidence. Air-cooled, 89cc, SOHC powerplant puts out smooth, reliable 4-stroke power perfectly suited to the smaller novice rider. 16mm Mikuni carburetor ensures crisp, dependable throttle response. Smooth-shifting, 3-speed transmission with automatic clutch, geared to ease the beginner into the basics of shifting, helps make riding easier. Rigid frame design combines with a compact, 40.9" wheelbase for extremely quick steering and agile handling. 14" front and 12" rear wheels with knobby tires offer superb grip and exceptional wear. Low, 24.6" seat height provides handling-enhancing low center of gravity and allows most riders to put both feet down for added confidence. 6.3" of ground clearance and a rugged engine skid plate maximize undercarriage protection. Long, motocross-style seat is low, comfortable and allows easy rider movement.